Computer Science opens more doors for students than any other discipline in today’s world. Every student should have the opportunity to learn computer science. It helps nurture problem-solving skills, logic and creativity. By starting early, students will have a foundation for success in any 21st-century career path. 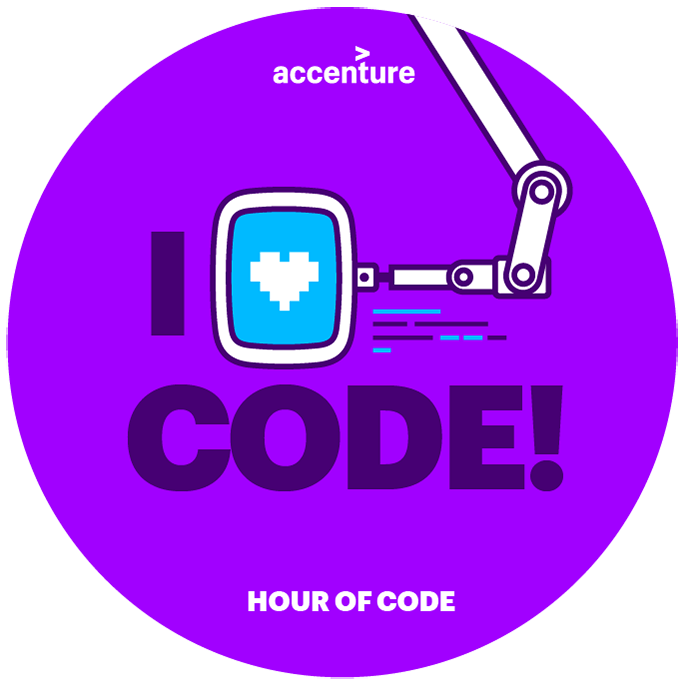 Accenture shares a special relationship with Code.org. We are proud to support their important mission to bring computer science education to students everywhere. Join us as we inspire the next generation of diverse technology talent during Hour of Code Week, December 3 – 9. Code.org’s Hour of Code grassroots movement is seeing a real impact in Computer Science education. Now in its 5th year, we can do more as we look beyond an hour of code and use this momentum to urge schools to commit to engaging in years of computer science. Paul Daugherty, Accenture’s Chief Technology & Innovation Officer and “Chief Coder,” learned to code as a kid and was instantly hooked. He had big dreams and that hasn’t changed one bit. Today Paul is passionate about using technology innovation to change the world and equally passionate about ensuring that we keep the momentum going to give every child the opportunity to learn computer science. Accenture's coding tutorial lets students learn about artificial intelligence by teaching a robot how to explore a new planet, and is now available in 15 languages: English, Chinese, Dutch, Filipino, French, German, Greek, Hebrew, Italian, Polish, Portuguese, Slovak, Spanish, Swedish and Vietnamese. Give our Accenture Intelligent Space Exploration coding tutorial a try! "Through our corporate citizenship initiative Skills to Succeed, we are empowering people around the world to reach their potential…and that includes preparing the next generation with the skills to work in the digital economy. Hour of Code is a fantastic opportunity to put these ideals into action." Looking to help inspire students. Available in over 45 languages.